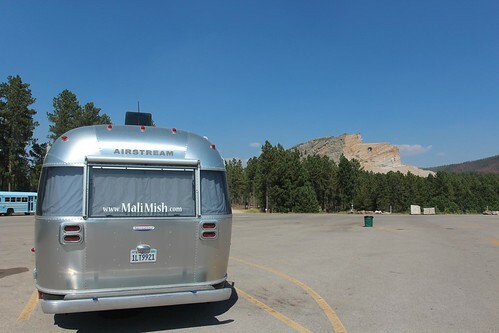 Mali Mish - Day 33: Crazy Horse Monument and Mount Rushmore. 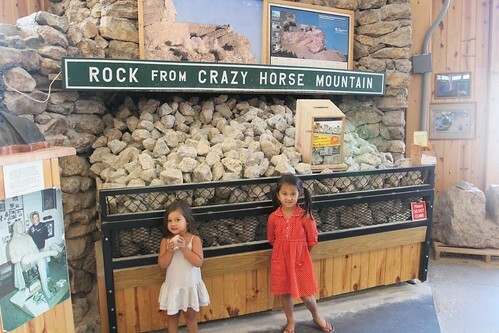 Our plan is to make it down to both the Crazy Horse Monument as well as Mount Rushmore. These are some of the most popular attractions in the area and it would be a shame to miss them while we are here. As many of you may know, both of these places feature sculptures carved into massive granite rocks. As much as they are similar in that regard, there are just as many, if not more, differences between them. We had some choices to make as we left Deadwood. 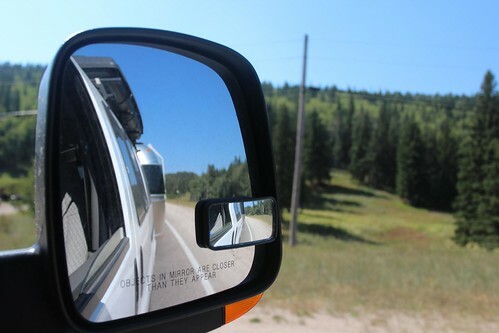 Since we are towing, we could either beeline for I-90 eastward and drive around the Black Hills before coming back in, or we can just be adventurous and drive through the mountains. Since we have done so much mountain driving on this trip so far, it really isn’t that big of a concern for us anymore so we headed straight south through the Black Hills. This part of South Dakota also happens to be a motorcycle mecca. 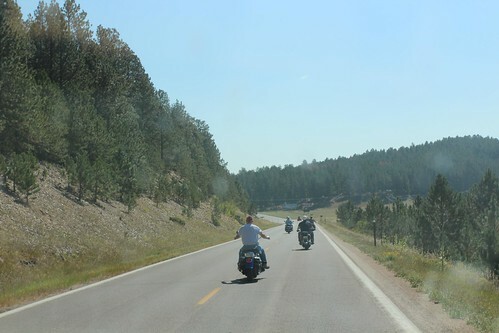 Just to the east of Deadwood is a town called Sturgis. Each year, one of the biggest motorcycle rallies is held there. People from all over the world come here to attend it. Because of that, the beautiful scenery and the windy mountain roads, there are always tons of motorcycles here outside of the snow season. As we headed south through the mountains, we came upon a little town called Hill City, SD. It was a perfect place for us to stop and grab some lunch. 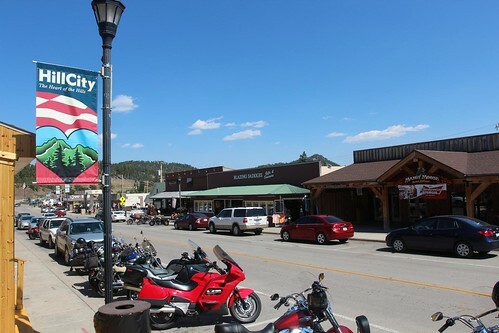 At just under 1,000 people, Hill City is a small little town in the Black Hills. It is also a place where a couple of different railroad lines intersect. Since the 1950s, there has been a tourist passenger train that takes visitors from here to Keystone and back. It has been featured in several televisions shows and movies including Marlene’s favorite soap opera, General Hospital. Hill City is also famous for having the most complete Tyrannosaurus Rex fossils ever found. The fossil caused a fair amount of controversy and landed a paleontologist in prison for 2 years for illegally excavating it from the land that is owned privately. The fossil was eventually returned to the land owner and auctioned off for over 8 million big ones. That’s not bad for a pile of old petrified bones. 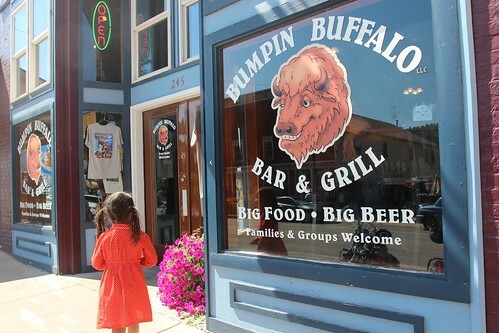 We ate lunch at a restaurant on the main street called Bumping Buffalo. The food was mediocre but the service was very good. 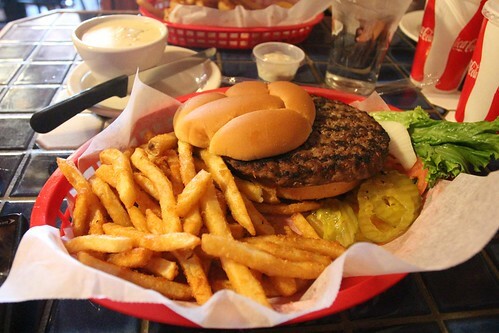 One of their featured items on the menu was this burger with a huge 3/4 lb patty. I had high expectations for it but when it showed up on our table, it was a bit disappointing. Sure the patty was big but they served it in a regular size bun. Maybe it was purposefully done to exaggerate the size of the patty but this is an example of bigger isn’t always better. After Hill City, we made it to Crazy Horse Monument. It cost $10 per adult and kids under 6 are free. 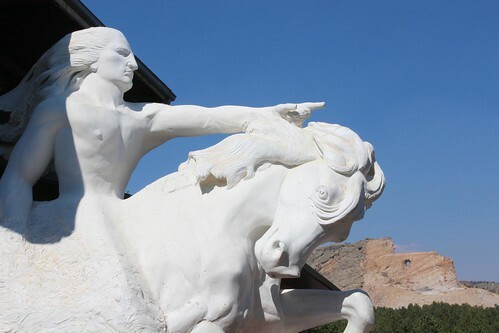 The monument is named after a Lakota chief who refused to sign any treaties with the US government and also lead his warriors to victory in Battle of the Little Bighorn in 1876. Known as a fierce warrior and great leader, he is an inspiration to many native Americans today and in history. The memorial is a work in progress that will take many more years to complete. I am not sure what the expected completion date is but I doubt it will be done in my lifetime. 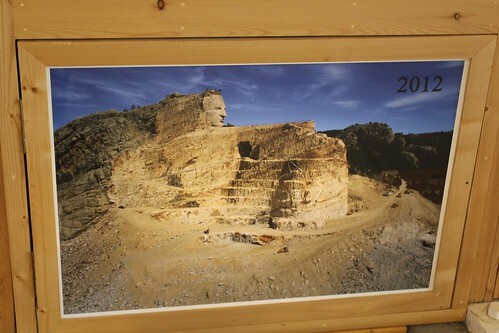 It is believed that there are no known photographs that exist of Crazy Horse. That means the sculpture had to be made based on descriptions of him passed down through generations of his family and friends. Because of that, the likeness of the sculpture serves only as a symbol of his spirit. The memorial was commissioned by a Lakota tribe elder, Henry Standing Bear, back in 1929. It was a direct response to Mount Rushmore that had just been completed a few years prior. Henry Standing Bear wanted to show that the native Americans had heroes, too. Polish American sculpture Korczak Ziolkowski was requested as the artist for the project. The entire project has been completely funded privately and has on numerous occasions refused government funding. Korczak dedicated the rest of his life to this memorial and passed away at the age of 74 in 1982. The project has since been carried on by his wife and children. In 1998, sixteen years after Korczak’s passing, the face was completed and dedicated in a unveiling ceremony. Unlike a government-run outfit, there are more commercial sponsors, larger variety of merchandise and seemingly less attention to its historical authenticity. I am just going by my gut feeling as I toured the artist’s studio exhibit and the former home of Korczak that is on site. The home looks like it was just remodeled to look more like a museum than a preserved artifact of the sculptor’s life. Since Korczak’s wife is now in charge of the project, I am sure she would like people to believe that she always kept her home museum-like even while raising their 10 children in an Native American reservation. 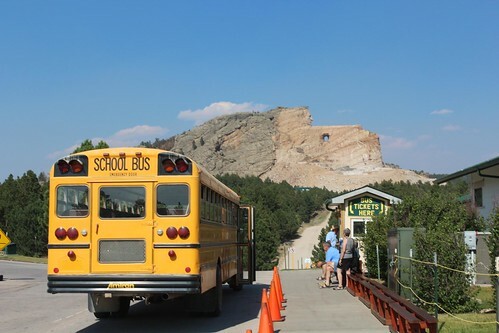 If you wanted to get closer to the monument, there is a yellow school bus that you can take that will take you to the foot of the hills. I don’t think you are allowed to climb up to the head and there is also an additional charge for the ride. Since we still have another set of rock faces to see on the other side of the hills, we opted out and headed towards Mount Rushmore. 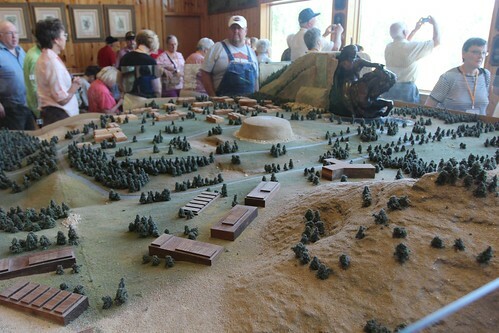 As compared to Crazy Horse, Mount Rushmore is a noticeably smaller. But Crazy Horse is still a work in progress and Mount Rushmore has been completed since 1937 so that makes it more impressive in my eyes. 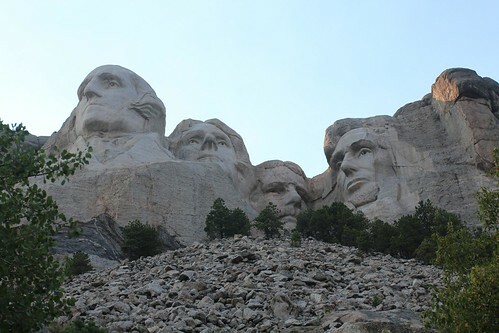 The fact that every person in America has been seeing photographs of this piece of granite since they were born also adds to sense of awe when you are finally face to face with these four presidents. A few years prior to its completion in 1933, the nation park service took over jurisdiction of the project. 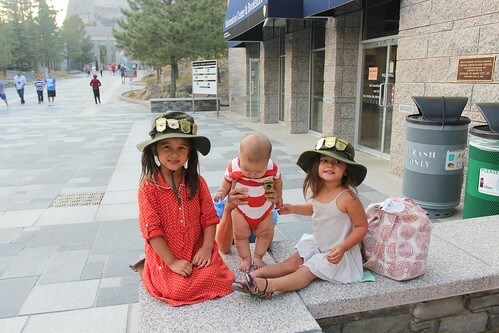 Even though it isn’t a national park but rather a national memorial, they do have a Junior Ranger program. That means Ava will be adding to her collection of badges to get a total of 4 and Mila will be close behind with 3. The artist commissioned to build such a great project was a Danish-American sculptor Gutzon Borglum. He was born to a polygamist Mormon family in Idaho and was always well known as a large scale sculptor after working on Stone Mountain in Georgia to commemorate the Confederate States of America that lead us to the civil war. He was fascinated with the theme of heroic nationalism and was also extremely outspoken about his beliefs. Controversially, he was a member of the Ku Klux Klan who also financially backed his work on Stone Mountain. 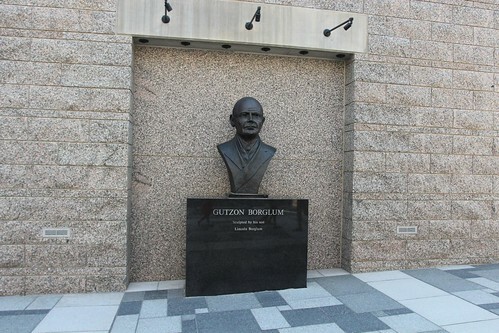 After 14 years of working on Mount Rushmore, Gutzon died from an embolism at the age of 73 in 1941. The project was left to his son Lincoln Borglum,who was named after his father’s favorite president, to complete. 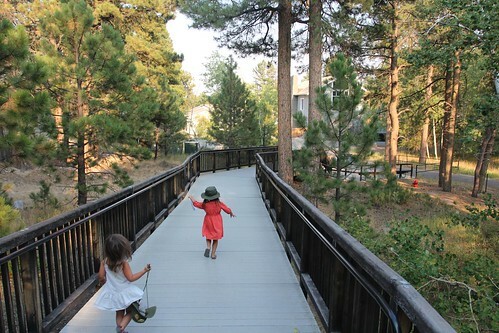 Mount Rushmore, like many other national parks and monuments, made for a great opportunity to do a little homeschooling. 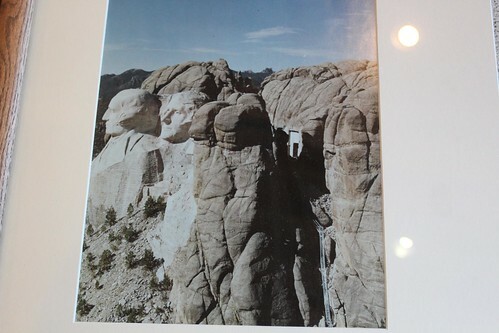 Before this trip, the only president Ava knew about was Abe Lincoln and his log cabin. She got to learn a bit about Theodore Roosevelt as we were traveling through Colorado and now she got to learn about 2 more presidents. 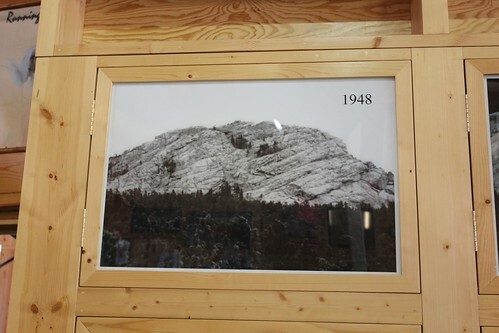 The scaled model of the sculpture inside the artist studio shows that the original intention was to have much more than just their faces on the mountain. Because of insufficient funding, the project ended short of its complete vision in 1941. There was also a plan to have a room carved into the granite walls behind Lincoln’s head what would serve as a hall or records of this project. The room behind Lincoln’s head was never intended to be accessible by the public and is not visible from the trails of the memorial. 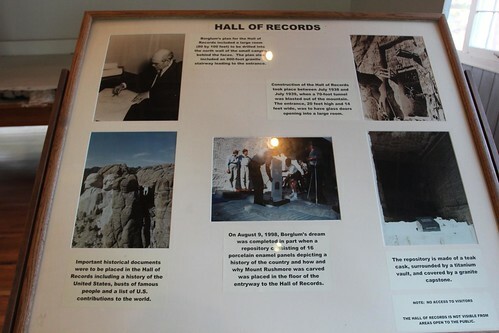 It was never completed to Gutzon’s vision but there is a smaller version of the room that holds inscribed tablets outlining details of the project. 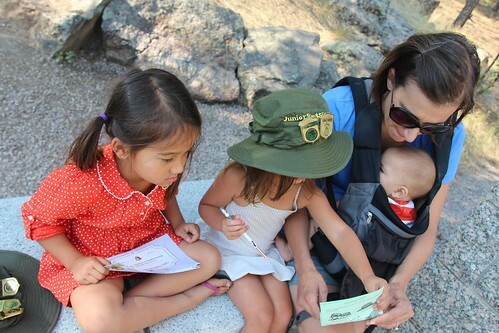 As the girls were sworn in as Mount Rushmore Junior Rangers on our way out, the park ranger surprised Luka with a honorary Junior Ranger badge for being a good boy on our tour. As the sun was setting over the Black Hills, we headed east into the prairie and out of the Black Hills. 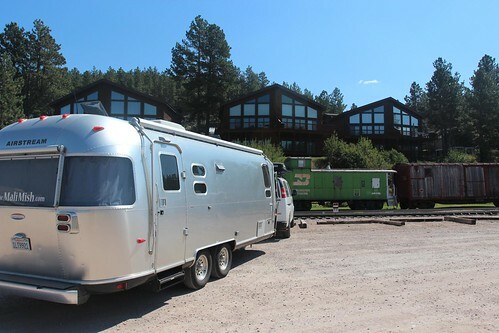 From here on out, we will be trekking for the next several days over the rest of South Dakota for a few nights of boondocking before we will settle in another campground. 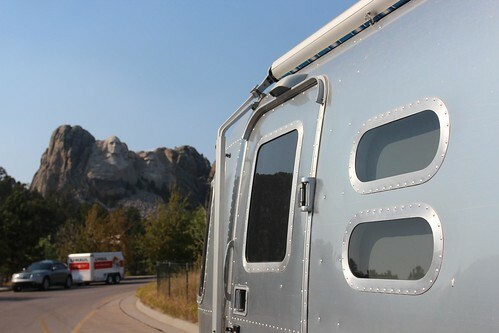 Guess where we are parked tonight in Rapid City? That’s right, it is our first time at a Cabela’s and we are liking what we see. 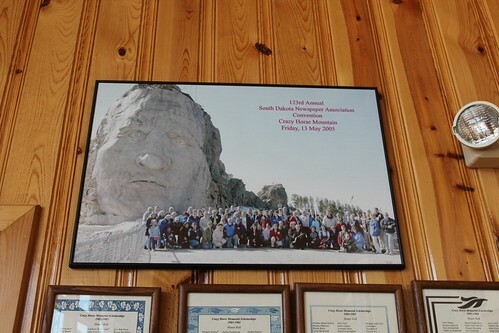 2 Responses to Day 33: Crazy Horse Monument and Mount Rushmore. Hi! I discovered your blog a few weeks ago and have enjoyed following your travels. 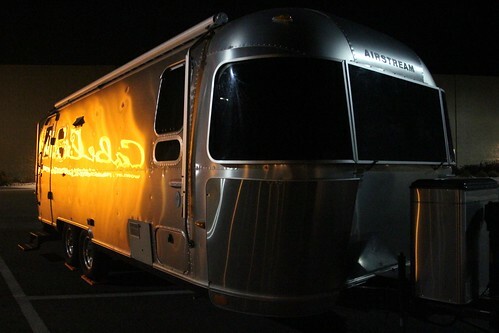 My husband and I also live and travel in an airstream and we love seeing other people on the same path. It’s especially entertaining to read about your adventures with the kids in tow:) I love the little bits of history included in your posts- I think I learned more about Mt. 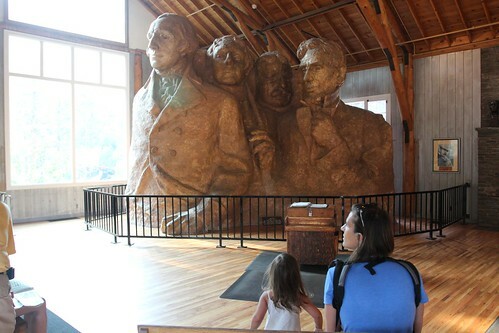 Rushmore from this post than I did from our recent visit! Looking forward to seeing where you go next!